“The program for this evening is not new, You’ve seen this entertainment through and through” I can’t resist, a good quote from The Doors, but is feels strangle fitting. Sicario feels very familiar as if you already know the beat if not the words. Don’t perceive this to be a problem, it helps the viewer slip easily into a world we don’t and will hopefully never know. The pointy end of the war on drugs. Kate Macer (Emily Blunt) is an idealistic and possibly naïve FBI agent. 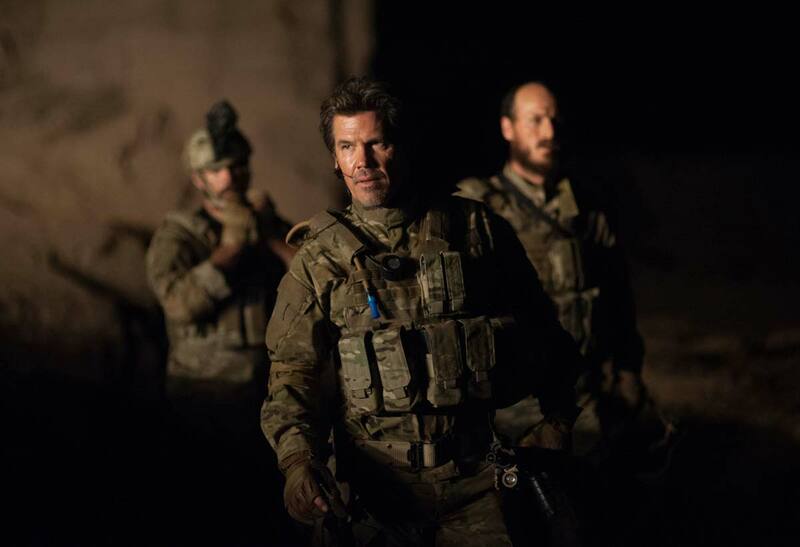 When her job leading a hostage recovery team overlaps with the war on drugs she is enlisted into a joint task force run by Matt Graver (Josh Brolin). 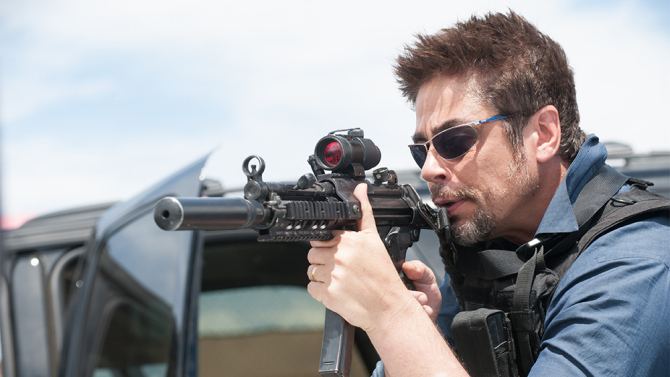 Matt claims to work for the Department of Defence but is clearly CIA, he works with Alejandro (Benicio Del Toro) whose role and origin is shady to say the least. When you start a review saying how good a film looks it usually means the film itself was pretty but dull. This is far from the case with Sicario, Roger Deakins brings the same beauty to his photography that he did with Skyfall. The images are often disturbing, but boy do they look good through Deakins lenses. But all like the best cinematography it isn’t just about pretty pictures, it is how the more mundane shots are lit and framed to find the required mood. Back to the film itself. There is a constant sense of dread, melancholy and despair that underlines the film similar to that experienced in No Country for Old Men (2007) and director Denis Villeneuve’s earlier film Prisoners (2013). This we see through Blunt’s character who is both the heart and the moral compass of the film. We as viewers are kept as much in the dark as she is as to the agenda and mandate of the task force. Like her we are also given the opportunity to make our own mind up of the right and wrong of the situation. While she is the heart and soul of the piece, Matt is ringmaster and Alejandro a spectre hanging over proceedings. The film is full of amazing dialogue that tells us all we need to know with without ever becoming Basil Exposition. One quote that frames the film comes when Kate asks Alejandro for an explanation of what is going on, his response: “You ask how the watch is made. Keep your eye on the time.” Another of his quotes is a little more arch, it is directed at Kate but is also an explanation of the film: “Nothing will make sense to your American ears. You will doubt what we do. But, in the end, it will make sense.” There are two more memorable quotes, one from Matt about why they do what they do, the other from Alejandro (again) about justice. I won’t publish them as they could stray into plot spoilers, least to say, they like the actions of the characters firmly nail their colours to the mast. The film doesn’t preach the right or wrong of the situation, it puts its characters in a scenario and lets the audience decide. This is far more intelligent film-making than we normally get from mainstream cinema. Anyone who has seen The Wolfman may be understandably concerned by a Blunt / Del Toro reunion, don’t worry, they are both perfectly cast and brilliant as is Brolin. All the characters come across as real people not as sketches whose personality doesn’t stretch beyond the scenario they are in. 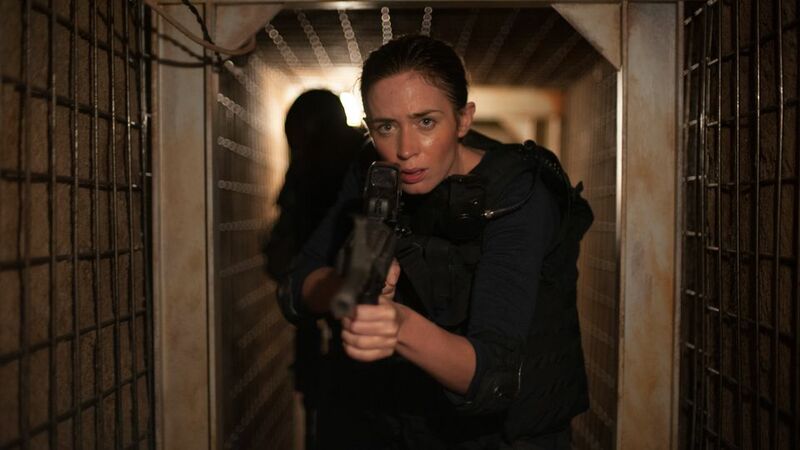 Emily Blunt continues to show her versatility having done everything from costume drama to sci-fi action via comedy. A special mention must be made for Daniel Kaluuya as Reggie, Blunts FBI partner, he is totally natural and believable in the role, offering a lighter and sometimes amusing angle without ever distracting from the film. He is a funny guy, not the comic relief dropped into a movie to lighten the tone. I could imagine Jessica Chastain in the Blunt role, other than that I can’t think of anyone else who could have filled the shoes (of flip-flops) of the three leads. The same is true of director, Denis Villeneuve, I can think of many top directors that could have done good job but they are sure to have distracted us with unnecessary flourishes. Interestingly the film appears to be based on an original story (early contender for best original Oscar nomination) by actor and first time writer Taylor Sheridan. It is unclear how much the taut storytelling is down to the director and how much the writer, whoever is responsible did a magnificent job. The film is honest and brutal, even brutally honest, but still manages to revel in its moral ambiguity and uncertainty. This is where a review drops in the but…. However, there is no but, I really have nothing negative to say about the film. It may disappoint a few people as it has been sold as more of an action movie than it is, but that is the fault of the distributors not the film or its makers. It is a solid film that doesn’t put a foot wrong. I don’t think it has the originality or is showy enough to win best picture or director at the Oscars, but it certainly good enough for a nomination or seven. Carol: A stunning film that has Oscar nomination written all over it, how did it miss out? I have no idea, I think or at least hope we have come far enough in 2015/16 for the lesbian subject matter to not be an issue. There is no conceivable reason for the film not to be nominated, unless I am just blinded by how much I loved it. Ex Machina: One of my favourite films of the year, and one of the most assured directorial debuts in a long time. The reason it missed out? The academy don’t like sci-fi. Movies like The Martian and Gravity are close enough to reality to slip under the radar, but real sci-fi scares them. A few exceptions are District 9, Avatar and E.T. the Extra-Terrestrial way back in 1982. Inside Out: Nearly twenty years after Beauty and the Beast, Toy Story 3 received a best picture nomination, the first animated film to do so since the Best Animated Feature category was introduced in 2001. Pixars cleverest and deepest film, but also its most accessible. Why wasn’t it nominated? No reason, other than as mentioned Animated films don’t often don’t get a nod. 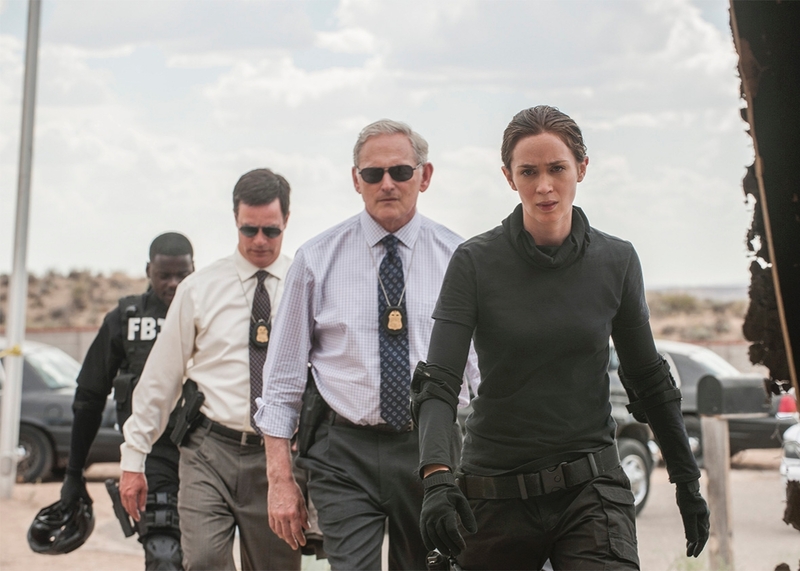 Sicario: A tense crime thriller that is nothing short of perfect. As I have mentioned before the film isn’t originality or showy enough to win best picture but it certainly good enough for the nomination. What two movies would you pick to fill the unused places? Back in April last year, I speculated that 2015 could be the year of the billion dollar blockbuster. At the time Fast & Furious 7 had just become the 20th film to top a billion dollars. I suggested that there would be four or five (more) billion dollar movies by the end of the year. How did they do? At the time or writing Fast & Furious 7 had passed $1.2 billion, it ended up over $1.5 Billion. Star Wars: The Force Awakens was my nailed on billion dollar film, it is over $1.5billion and counting, and is yet to open in China could top $2billion. I predicted Jurassic World would make a billion, made over $1.6billion and will be the years second highest grossing movie after Star Wars. I thought Avengers: Age of Ultron would surpass the first Avengers movie, it came up about $100million short but still had a healthy $1.4billion. I said of Minions that it would smash the half billion Despicable Me took and was spot on, but thought it would fall a little short of a billion, at £1.15billion, I was wrong. After the success of Skyfall, I tipped SPECTRE for a billion, still on general releases it will increase on its current $865million but won’t make the magic billion dollars. The Hunger Games: Mockingjay – Part 2 took $637million, this is short of the £800million I predicted but is still a healthy return for what is essentially half a film, especially when you add it to Mockingjay – Part 1’s (2014) $755million. It also fared better than the other two big YA franchises: Maze Runner: The Scorch Trials took $312million and The Divergent Series: Insurgent, $297million. The big budget flop of the year was Fantastic Four. Not the worst “underperformance” of the year but the most publicised. I estimated the studio would be looking for north $750million. It took just $168million. I did say it would need good reviews and strong word of mouth, it got neither. Compare this to Fantastic Four (2005) that took $330million. The gap is made worse if you adjust for inflation, the 2005 movie took around $400million in today’s money (just accounting for the value of the US dollar), or closer to $500million if you adjust for ticket prices that have risen above inflation. Based on return on investment, the most successful film of the year is Fifty Shades of Grey, its $570million box-office represents around a 1425% return on investment, beating even Star Wars: The Force Awakens that sits at around 850% (1000% if it reaches $1billion). So what are the billion dollar contenders for 2016? Batman v Superman: Dawn of Justice opens in March. The Dark Knight topped a Billion dollars back in 2008, 2013′s Man of Steel underperformed at $668 million. DC need to be approaching $1.5billion if they are going to compete with Marvel Studios but will probably grateful as long as the number has three commas! Captain America: Civil War opens a month later in April. Captain America: The First Avenger took $370million. Its sequel Captain America: The Winter Soldier smashed this with $714million. This time around they must be looking for the magic billion, especially when you consider, it isn’t just Captain America, its Captain America v Iron Man, and Iron Man has real box office pedigree. X-Men: Apocalypse is next up in May. 2014’s X-Men: Days of Future Past is the highest grossing movie in the franchise at just shy of $748 million. The trailer looks good, with good reviews and word of mouth it should beet Days of Future Past, I’m not totally sure X-Men has the fan-base to top a billion dollars but it could! Finding Dory comes out in July just in time for the school holidays. Finding Nemo made $895million in 2003. When you consider ticket prices are now 40% higher even before you add 3D premiums, that is well over a billion in today’s money. Finding Dory should easily top the billion dollar mark joining other animated movies Minions and Frozen. Fantastic Beasts and Where to Find Them opens in November. As a new franchise it is an unknown quantity, but it is part of the Harry Potter universe, and the last of J.K. Rowling’s wizarding movies topped $1.3billion (for half a film). It could just make a billion. Rogue One: A Star Wars Story opens in December in the same slot The Force Awakens took in 2015. This is a real unknown. As a spinoff rather than “an episode”, part of a trilogy, it isn’t clear how people will react. However given the good will The Force Awakens has earned I suspect it will do well, especially among fans of the original film; it is after all the story of “our most desperate hour” as described by Princess Leia in her message to Obi-Wan. With a strong cast and an up and coming director it promises a lot. The $773million that Guardians of the Galaxy took should be its minimum expectation. Check back in a years time to see who did make a billion dollars! A slow month with just three new movies and one screening of a classic. Krampus: A Christmas comedy horror that owes a debt to Gremlins. It has both funny and horror moments and is largely entertaining but it isn’t Gremlins. Victor Frankenstein: Do we need another remake of Frankenstein? Yes, if it has something new to say. Telling the story from Igor’s point of view, this new version looked like it could have something else to say. Then it reverts to the usual clichéd camp, looking at times like the Guy Ritchie Sherlock Holmes movies. Star Wars: The Force Awakens: Large parts of the story are taken straight from the original film, this works surprisingly well. The new characters are all good and fit well with the returning ones. Most importantly it is a fun action adventure that gives a new hope for the franchise. Doctor Zhivago: Rereleased as part of the BFI’s season on love. Never turn down the chance to see a David Lean movie. It has always been a fantastic film, all the better on the big screen.